Discussion in 'JS Plugin Releases (RMMV)' started by Jeremy Cannady, Nov 1, 2015. Simple script to make an item combination system. Please follow the notetags exactly. if it clashes with another script let me know! Makes and Item Combination system. Put the script, must be named ItemCombination.js and needs to be Java script and not text file. Ushi, Lindar, LuLight and 3 others like this. This looks like a really nice script. Any body can use anything I create for whatever purpose they want. No credit necessary. Cut, copy and paste it doesn't matter to me. Just message me if there is any problems or bugs. Also my script aren't that fancy because they are made for my needs first. If any customs changes anyone wants then just message. I just tried it out and for the record it is impressive! There is one significant issue I am having. The Combine screen does not scale to larger resolutions. It seems locked at default. Another is that combinations that use more than single digit amounts overlap. If you are interested in feature requests that don't completely redefine the plugin I can offer some. Starting with the option of defining experience to improve changes automatically. Something like, each success has a chance of increasing the success rate by a set amount. <auto_improve: 0.25, 0.01>This note tag might cause that items success to automatically raise by 1% when its successfully created 25% of the time. I will check on that. I can improve the spacing between the required amounts. The success chance increase thing seems easy to me. I can mess around with it and get back to you. I am at work so my work computer is so slow so I can't really do much at the moment. Yes I am using Yanfly's Core to run at a around ~720p with multiples of 48, but I haven't settled on a specific resolution. Another feature that I can think of, off the top of my head would be dismantling. Possibly as simple as running the combination in reverse, but having each ingredient use a defined chance of surviving. <dismantle: 0.50>Would make the item dismantle into its ingredients, each having a 50% chance of surviving. Dismantles can be learned with normal recipes, or separately. I am sure I can think of more if you like! I may just be foolish in not knowing how to do this, but is there a way to make this combination option a special skill for a Chemist in the party instead of just being in the normal party menu? I don't have any scripting skills however, I have some great ideas to expand on this plugin if you like. I really really really, appreciate this plugin my project is very Item heavy. Thank you. I am actively working on crafting weapons and armor. I hope someone doesn't beat me to it. It is crucial to my game as well. I will update you if I have any first drafts made. This looks amazing! 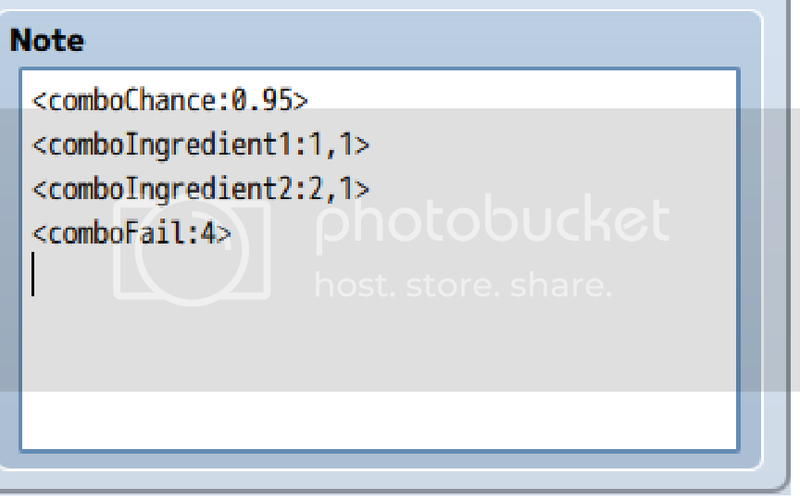 Is there anyway to make it as a recipe system? 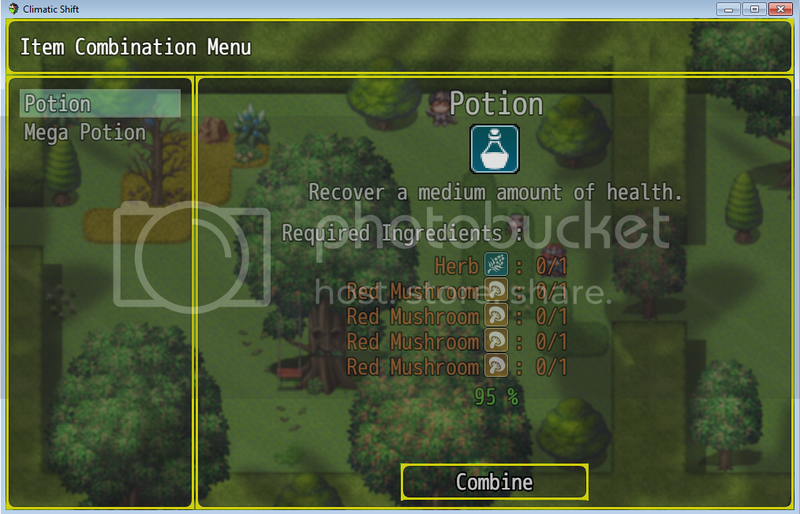 So the player needs to find/learn the recipe before being able to make it? EDIT: didn't read it properly. Sorry! Amazing work! I've got a Scene_CraftingMenu is not defined. How do I fix this? Thanks in advance. Kept trying this one and it still says "Scene_CraftingMenu is not defined". I'm calling this one through an event and have put this in the script box. And yes, i've turned this on in the plugin manager. I will have to figure out the real problem later. and how add combine menu ? The menu should be enabled in your game by default if you have at least one thing you can combine. If your note tags aren't set up correctly then bad times. I think you posted a picture but it is not working over here. It finally worked! Thank you!! Another suggestion is to have the "successful" and "failed" sounds customizable as well. But anyway, thanks for this plugin! [EDIT] When i press escape while in this menu, the game exits. [EDIT2] I replaced "goto" with "push" and now it works fine.